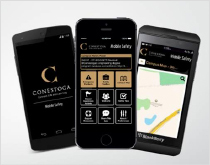 To work with the Conestoga Community to provide a safe and secure work and learning environment. To promote partnerships with the college community and local organizations. To enhance personal safety through prevention, education, and compliance. Security Services provides 24-hour security at the Doon, Cambridge and Waterloo campuses and day, evening and 24-hour weekend security at the Guelph campus. Assistance is also available to students and staff at the Stratford, Ingersoll and LINC campuses by calling the Doon Campus. The Occupational Safety Office is part of Safety & Security Services and is responsible for ensuring the college is complying with all applicable federal and provincial health & safety legislation. Learn about Conestoga's new Substance Use Guidelines.